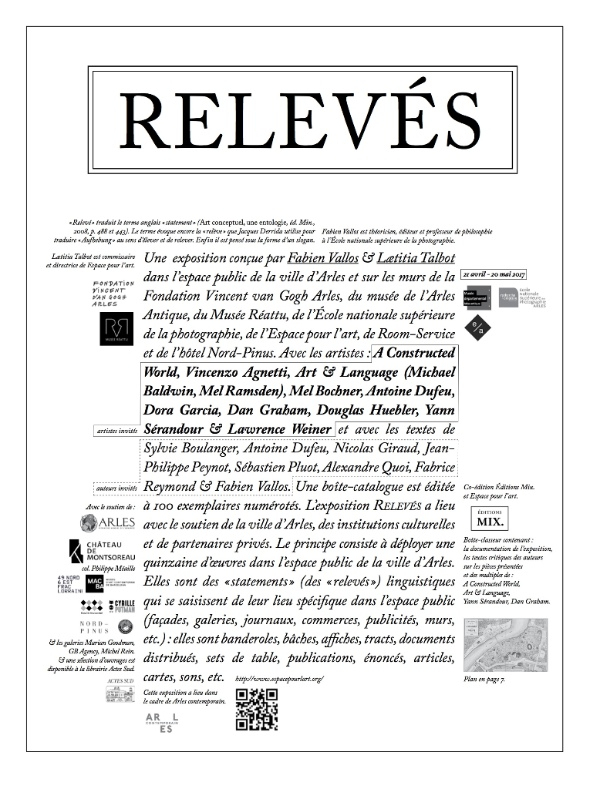 An exhibition curated by Fabien Vallos and Lætitia Talbot in public spaces within the City of Arles and on the walls of the Fondation Vincent van Gogh Arles, the Musée de l’Arles Antique, the Musée Réattu, the École Nationale Supérieure de la Photographie, the l’Espace pour l’art, Room-Service and the Hotel Nord-Pinus. With artists A Constructed World, Vincenzo Agnetti, Art & Language (Michael Baldwin, Mel Ramsden), Mel Bochner, Antoine Dufeu, Dora Garcia, Dan Graham, Douglas Huebler, Yann Sérandour and Lawrence Weiner and with texts by Sylvie Boulanger, Antoine Dufeu, Nicolas Giraud, Jean-Philippe Peynot, Sébastien Pluot, Alexandre Quoi, Fabrice Reymond and Fabien Vallos. 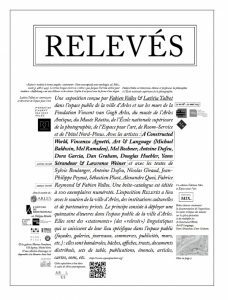 The exhibition Relevés (“Statements”) is taking place with the support of the City of Arles, cultural institutions and private individuals. It will consist of some fifteen works deployed in public spaces in Arles. The works are linguistic statements which appropriate their specific site within the public space (facades, galleries, newspapers, shops, adverts, walls etc.). They take the form of banners, posters, pamphlets, distributed materials, placemats, publications, statements, articles, cards, sounds, etc.